This TAA compliant 3-port USB 3.0 hub lets you expand the functionality of your MacBook Pro, MacBook and other USB-C enabled laptops by adding three USB-A ports. The compact USB hub supports USB Power Delivery, which means that you can power and charge your laptop through its USB-C port while simultaneously powering the hub. 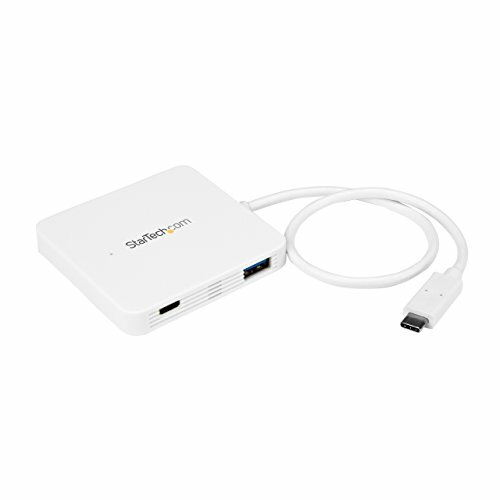 With its compact and rugged design, you can take this portable USB 3.0 hub anywhere you go. It’s easy to tuck into your laptop bag and only takes up a small amount of desk space when you connect it to your workstation. For portable applications, having the integrated host (USB-C) cable means one less thing to remember to carry with you. The 3-port USB 3.0 hub offers a built-in USB cable that’s long enough to reach your laptop or tablet’s USB 3.0 port, regardless of where the port is located. This gives you more desk placement options, which makes it easier to create a comfortable and space-efficient work area. This USB-C expansion hub is multi-platform compatible, which means it will work with a wide range of laptops. It also works with a range of operating systems such as Windows, macOS, Linux and Chrome OS. It installs automatically once you connect it to your laptop, so you can be up and running in seconds.